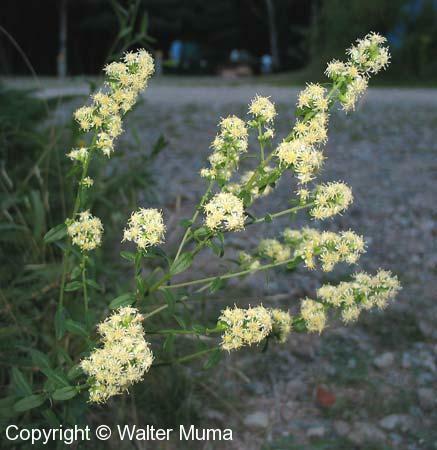 Distinctive features: A white- or cream-flowered goldenrod. Flowers in clusters along the stem. 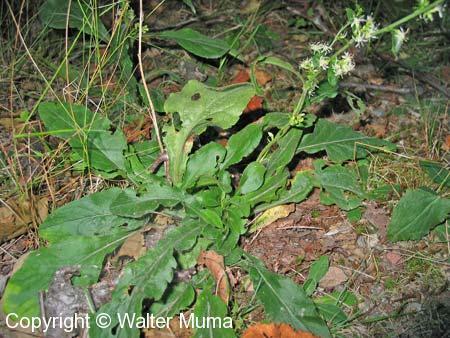 Large basal leaves present when flowering. 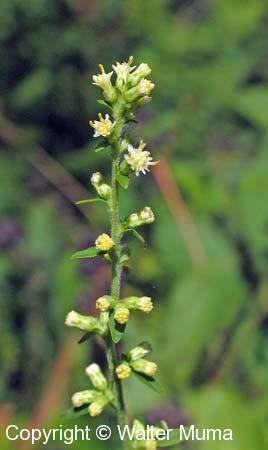  Blue-stemmed Goldenrod (Solidago caesia) - stem blue, flowers very yellow and smaller. 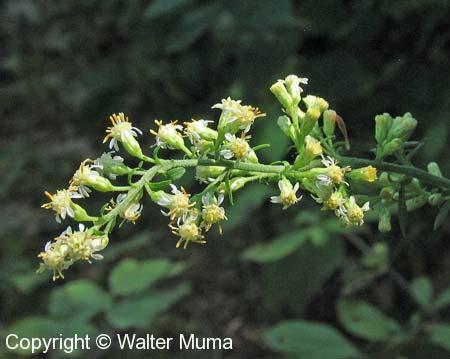  Hairy Goldenrod (Solidago hispida) - stem very hairy, flowers yellow. Flowers: Summer, Autumn; White; Indistinguishable parts (petals); White or cream-coloured. Late summer or fall. 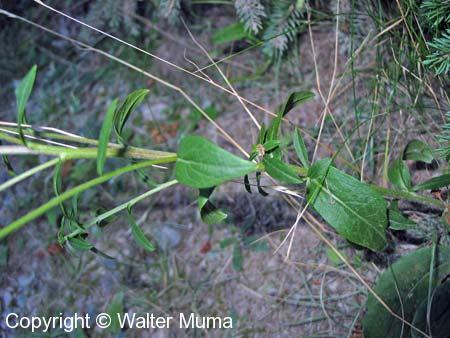 Leaves: Upper stem leaves very small, lower ones larger. Habitat: Forests, Fields and Open Areas; Open fields, open forests. 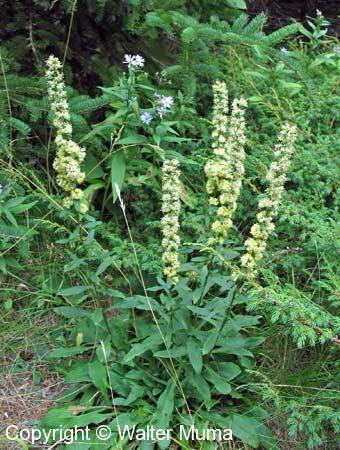 Status: Uncommon in Ontario, mainly found east of Lake Superior. Also found in scattered other sites here and there. Photographs: 178 photographs available, of which 13 are featured on this page. SCROLL DOWN FOR PHOTOGRAPHS. There may be one main stem, unbranched. 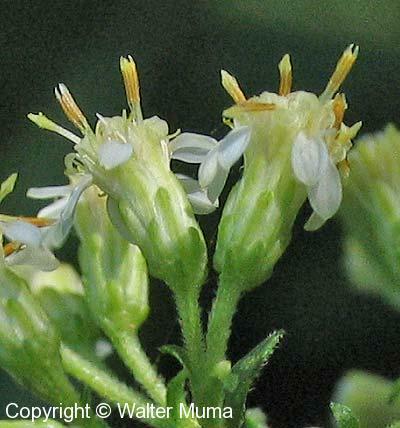 Silverrod is the only white-flowered goldenrod (aside from Upland White Aster (Solidago ptarmicoides), which looks like an Aster, but technically is a goldenrod!). It's uncommon in Ontario, but there's lots of it in Eastern Canada (New Brunswick and Nova Scotia). The photos on this page are a mixture of Ontario and Nova Scotia specimens. Or the main stem may branch part way up. 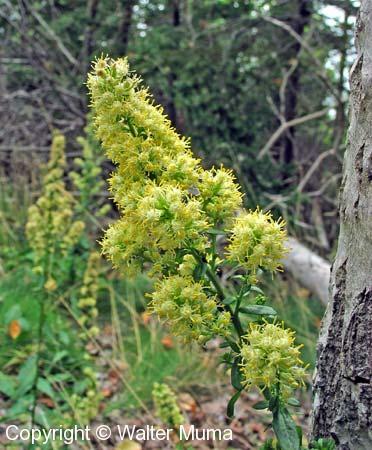 Note that the arrangement of the flowers along the stem is vaguely similar to that of Blue-stemmed Goldenrod (Solidago caesia) - both species have small clusters of flowers along their main stem. Sometimes Silverrod flowers have more yellow in them. Closer view of the flowers. Extreme close-up view of the flowers. Often the flowers are rather scattered up the upper part of the stem. Sometimes they are more closely packed. Most of the flowers in this photo are still flower buds (end of August). This shows the upper stem leaves - note how small they are. The upper stem leaves are small. Lower stem leaves are larger. Basal leaves - they're large and usually still present at time of flowering. 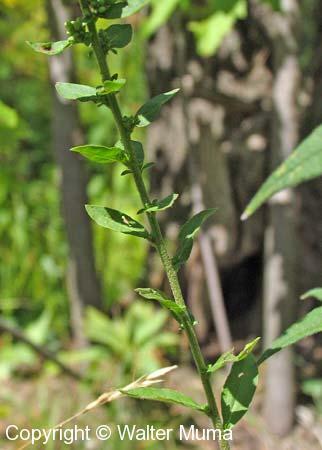 Hairy stem, but not as hairy as Hairy Goldenrod (Solidago hispida).